How does the rolly toys two-speed gearbox work? For rolly toys pedal vehicles with a two-speed gearshift , the pedal axle and the drive axle are each equipped with two adjacent pinions, over which two separate chains run. Gear 1 with 1: 1.4 reduction, gear 2 (overdrive) with a 1: 1 ratio. If the shift lever is in the shift gate in the middle position, the idling is switched, ie both chain trains have no drive function. For safety reasons, therefore, all tractors with gearshift ex works are equipped with a handbrake. Can I also retrofit the gearshift? For reasons of liability and warranty, vehicles with a shift are only available ex works. A retrofitting in the customer’s hand is therefore not recommended, the cutout for the shift gate must be absolutely precise. This can only be guaranteed with a special device on the assembly line. Why is only one rear wheel driven? Can the pedal crank be adjusted in height or size? The pedal crank can not be adjusted in height / size. The eccentric bearings are intended only for tensioning the chain. When pedaling on the tractor "crackling noises" and the pedals rotate in places empty? These “clicks” can occur if the chain tension is too loose. Therefore, the pedal cranks of all rolly toys tractors are guided in so-called eccentric bearings. To tighten the chain, loosen the 3 screws holding the eccentric discs to the body. Now place the eccentric bearings parallel to the left and right and in the same direction to the same number. For orientation, a line mark is visible on the tractor body. If the problem can not be solved with this measure, the pinion of the bottom bracket could be defective. To do this, loosen the lid on the bottom of the vehicle and see if the pinion is OK. In rare cases, the pedals must be replaced. Is there a pneumatic tire for the rollyX-Trac? We do not offer pneumatic tires for the rollyX-Trac, as these large vehicles would then be too heavy for a sensible playability with the required tire size. Which trailer fits which tractors? Basically, all Rolly Toys trailers, big and small, will fit all Rolly Toys tractors as they are part of the Rolly Toys range of accessories. However, we recommend to take into account the age of the child and the size of the vehicle, because a water barrel, for example, attached to a rollyKiddy could overwhelm smaller children. Why is my rollyPompa spray nozzle without water? To do this, carefully open the half-shells of the hand-held syringe and check that the check valve is correctly installed. 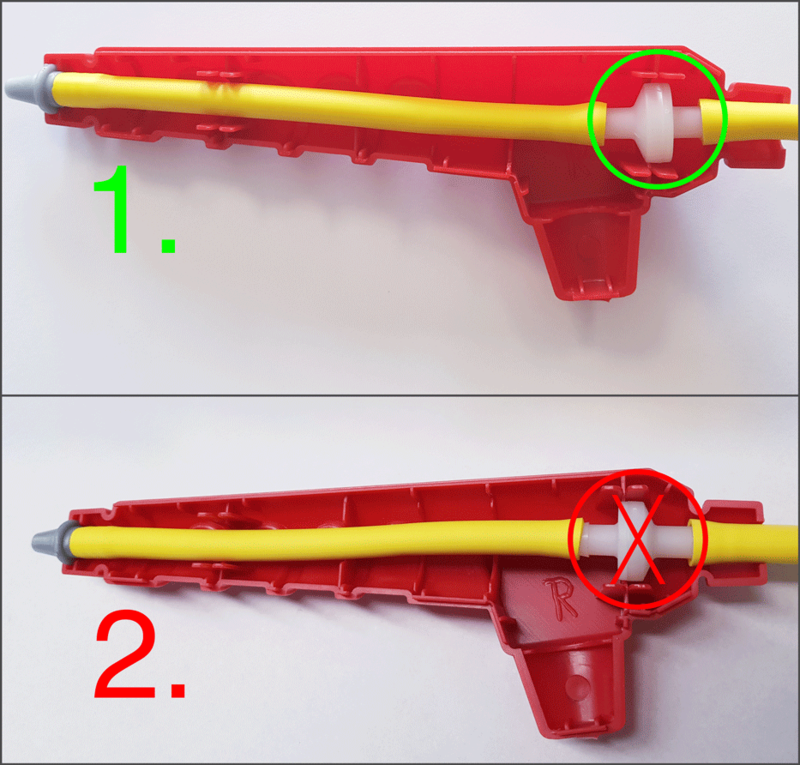 To operate, the slightly conical part of the check valve (see comparison in Figs. 1 and 2) must always point towards the nozzle. • Check valve installed FALSE! Which tractor is the largest? My tractor does not work? 01843 604448 and we will endouver to help you. Can I talk to someone about an assembley problem? Can the ware strips on the wheel be changed? Yes! The ware strips should be changed before any damage is done to the more expensive wheels. To fit the are strips they need to be warmed up in hot water then stretch fitted over the wheels. As they cool down they will shrink fit tightly to the wheel. Using a punch or flat headed screwdriver that can be hit with a hammer, hit downwards on the outer edge of the rim adjacent to the retaining hook of the main cap, of which there are two. Repeat this alternating from one to the other untill the caps pop off. For a fuller explanation please call our help line on 01843 604448. What is the numbered adjustment on the pedal crank for? This adjustment is purely for tensioning the chain and does not effect the child’s leg length. The numbers on the disc are present so that the two discs can be positioned in exactly the same position to prevent the chain jumping off. Why do some tractor have gears? The gears are generally found on larger models and allows for a smaller child to pedal in a lower gear. The large wheels on the biggest tractors can be difficult to pedal for children that have not pedalled before so the lower gear helps them to get moving. The gears are also useful where there is a gradient or rough ground to go over. The gear system is very simple and requires no extra maintenance. Only one rear wheel turns with the pedals. Only one wheel is driven by the pedal crank. Most toys of this kind are the same as they are all fixed wheel drive. When a vehicle turns a corner one wheel has to travel further than the other, if the wheels were locked together the vehicle could only go in a straight line. Motor Vehicles have a differential which allows some drive to both wheels this system would not work on a toy and would be very expensive and probably very hard to pedal. Which Tractor Will Fit My Child? Can we get spare parts for Rolly products? Yes. Most parts excluding the main blow moulded bodywork are available, even parts for some very old and much loved models. If you still have your assembley instructions you can just quote the reference numbers. If not dont worry you can try to identify the tractor from the pictures on our website and we will email the correct instructions to you.